I can never forget my dia-versary (diabetes anniversary) because it happens to fall on my dad’s birthday. Anniversaries help us to take stock, remember and to know how far we’ve come. So four years on, I confess that insulin-dependent diabetes is very much a part of life for me. Notice I didn’t say it was a normal part of life. Every day is a battle of vigilance, planning and monitoring. It’s as simple as that. One never lets one’s guard down. I wish I could report the happily ever after since I’ve been doing low carb and a healthier lifestyle but it’s not as simple as that. Recently I noticed my insulin needs jumping by at least 30%. It took me a month to figure out that the increased needs were a pattern and not a brief change due to illness or something else. I changed all my insulin pens, did a couple of days of basal fasting and since then have still been doing intensive monitoring as I create a new sliding scale for my changed needs. So yes, I re-read Dr Bernstein’s Diabetes Solution for tips, watched some Diabetes University YouTube videos and scoured the Typeonegrit Facebook page for posts on basal testing, basal and fast-acting insulin ratios and mapped out my own hourly to 2 hourly glucose levels for a week. It was a lot of work. So I don’t have the answers at the moment; all I know is that yes, some Levemir pens had expired and definitely needed to be chucked out. That helped quite a bit. But I still do have higher insulin needs which I’m now attributing to a house move and the stress of deadlines and the whole she-bang of dealing with contractor and packing and decluttering. 1. I’m grateful I’m still alive! Well I did start with an HbA1C >15%. So surviving that, seeing the reversal of diabetes complications such as proteinuria, retinopathy and frozen shoulder has been gratifying. 2. I’m grateful that I’ve found a new way of eating. Since doing a low carbohydrate moderate protein diet there is a sense of being able to manage my sugars. When I first changed my diet I did have many moments standing in the middle of the supermarket and feeling bereft. But those moments have become much less and actually I really appreciate the benefits of low carb diet with greater alertness, sustained energy levels and no post-meal food coma! And loving my food has resulted in me discovering new ways of cooking and baking and a whole new set of recipes. Life in the kitchen has become more fun than before. 3. I’ve discovered greater capacity in myself. One of the things my endocrinologist said to me at the beginning is that the low carb diet is unsustainable. I realize I’ve been able to stick with it because in my mind it is a non-negotiable. I seldom cheat (but yes I do occasionally – banana chips from Kuching are my downfall). But perhaps the OCD and driven part of my character has allowed me to keep on the straight and narrow and keep to the diet 99% of the time. In fact I don’t get other people eg those with type 2 diabetes who won’t give up their sweets and rice. I don’t undertand why they can’t or won’t make the change especially as the insulin resistance is often reversible in type 2 diabetics. I’ve got to the point where I will tell friends how to do the diet if they are interested but I will put zero emotional energy into seeing if they will try or keep to the diet. It’s so much a personal choice that I feel that it’s no point getting upset trying to change people. I need most of my energy to look after myself. 4. I’m grateful for my medical background – I think it’s allowed me to be a better patient with the ability to understand the medical literature and practices. There’s a whole load people don’t know yet and I have a greater vested interest in knowing the field as a patient. And the reality is that I pretty much make my own decisions about my disease management. I think my endocrinologist is not used to having a patient who is so OCD about getting normal HbAICs! And who expects a discussion on the latest insulins or outcome studies at each visit. 5. I’m grateful for a select online community for support. I check in regularly to the Typeonegrit group and while the majority of members live clear around the other end of the world, there is a unique shared experience and support here. How many people actually understand how crappy it is to have symptomatic hypoglycemia? Or would mull together to figure out unexpected highs or negotiating monitoring devices and endocrine visits? Or would get excited about the best low carb brownie recipe? These guys seriously rock. They are quick to help, knowledgeable and full of grit! It is encouraging to know there are people out there who would go against the flow of mainstream diabetes care and achieve such fantastic results. But we each know the numbers need a lot of work. And therefore the need for grit. I was reading recently that motivation and persistence may actually be genetically determined traits. So we are probably a very select genetically determined people who happen to share similarly lousy autoimmune systems! But the genetic predisposition may explain why there aren’t as many people who achieve such good control and give up almost as soon as they have started. Anyway after a couple of days of basal testing and extended fasting I was so pleased to be able to have a sit down breakfast. I had a kind of craving for noodles and I had a solitary packet of shirataki noodles in the fridge. This was a seriously fast prep – I think it took no more than 10 minutes to get the noodles to the table. Shirataki noodles are like an empty canvas waiting to be coloured. I threw on both dark and light soy sauce as well as corned beef, and the saltiness was soaked up by the completely flavourless noodles. If I were cooking for company I would have chopped up some vegetables to add to the texture of the dish but this was just a single one-person portion that was for a quick meal. It did not look glanourous or gourmet, but it sure hit the right spot! Drain the shirataki noodles and rinse under running water. Heat up a non-stick pan and dry the noodles for 2 – 3 minutes. Set aside the noodles. Heat up 1 tsp oil in the pan and add the corned beef, stirring through for about 1 minute. Add the noodles and the soy sauce and sesame oil. Keep sautéing the noodles. Add an egg over the top and stir through gently. Flip over the noodles in sections to keep the scrambled egg in larger pieces. 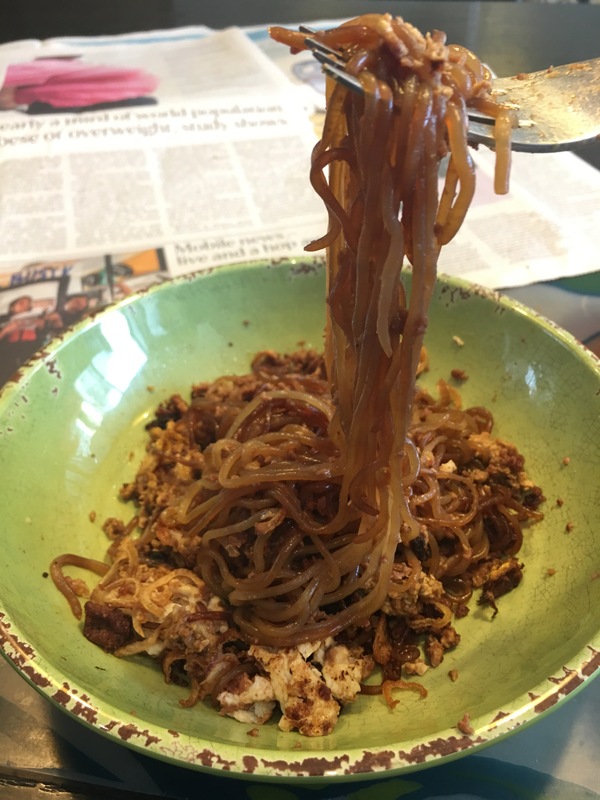 When the egg is cooked through, decant the noodles on a plate and top with fried shallots. I’ve been on a low carb diet for a few years now, but by choice – I lost 8kg this way. Was doing intermittent fasting, shirataki noodles and zoodles / coodles thing. I totally understand what you said about telling friends about the diet – I tell people about it but don’t bother after that, coz most end up not being disciplined enough to follow it. It’s no longer a diet for me, more a lifestyle choice. I must admit that I still eat carbs, but I choose to have carb-less meals too. Glad to see you’ve managed to adapt so many local recipes to suit your diet. Anyway I just wanted to let you know that there are lots of Instagram accounts focusing on konnyaku nooodles and you can look there for more inspiration for recipe ideas. Thanks so much ES! Always an encouragement that I’m not the only person doing this lifestyle. As you said it’s not a fad but a way of life and I love the cooking and discovery of ways to make it work! Thanks for the heads up about instagram – there are lots of great recipes out there.